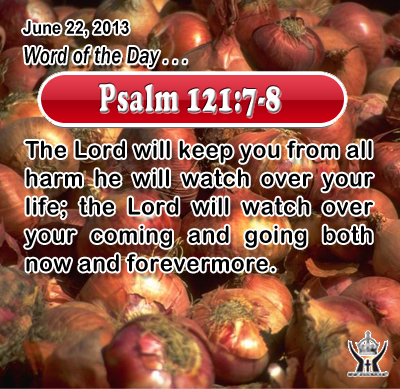 Psalm 121:7-8The Lord will keep you from all harm -- he will watch over your life; the Lord will watch over your coming and going both now and forevermore. Heavenly Father, Heavenly Father, Mighty Protector, Rock of our salvation, thank you that we cannot go where you are not. Thank you that our future is secure with you. Make this assurance the convicting power in our life to turn over our future and our life to you. By the power of Infant Jesus we believe this, and in his name we ask it. Amen. 24"No one can serve two masters; for either he will hate the one and love the other, or he will be devoted to the one and despise the other. You cannot serve God and mammon. 25 "Therefore I tell you, do not be anxious about your life, what you shall eat or what you shall drink, nor about your body, what you shall put on. Is not life more than food, and the body more than clothing? 26 Look at the birds of the air: they neither sow nor reap nor gather into barns, and yet your heavenly Father feeds them. Are you not of more value than they? 27 And which of you by being anxious can add one cubit to his span of life? 28 And why are you anxious about clothing? Consider the lilies of the field, how they grow; they neither toil nor spin; 29 yet I tell you, even Solomon in all his glory was not arrayed like one of these. 30 But if God so clothes the grass of the field, which today is alive and tomorrow is thrown into the oven, will he not much more clothe you, O men of little faith? 31 Therefore do not be anxious, saying, `What shall we eat?' or `What shall we drink?' or `What shall we wear?' 32 For the Gentiles seek all these things; and your heavenly Father knows that you need them all. 33 But seek first his kingdom and his righteousness, and all these things shall be yours as well. 34 "Therefore do not be anxious about tomorrow, for tomorrow will be anxious for itself. Let the day's own trouble be sufficient for the day. There is one Lord who has the power to set us free from slavery to sin, fear, pride, and greed, and a host of other upsetting desires. That Lord is Jesus who alone can save us from all that would keep us bound up in fear and worry. Jesus used an illustration from nature the birds and the flowers to show how God provides for his creatures in the natural order of his creation. God provides plenty food, water, light, and heat to maintain all that lives and breathes. How much more can we, who are created in the very image and similarity of God, expect our heavenly Father and creator to maintain not only our physical bodies, but our mind, heart, and soul as well? God our Father is completely reliable because it is his nature to love, heal, forgive, and make everything again. Jesus taught his disciples to pray with self-assurance to their heavenly Father: Give us this day our daily bread. What is bread, but the very staple of life and symbol of all that we need to live and produce. Worry is neither helpful nor necessary. It robs us of faith and confidence in God’s help and it saps our energy for doing well. Jesus admonishes his followers to put away worries and preoccupation with material things and instead to seek first the things of God his kingdom and morality. Anxiety robs the heart of trust in the mercy and kindness of God and in his loving care for us. God knows our needs even before we ask and he gives liberally to those who trust in him.